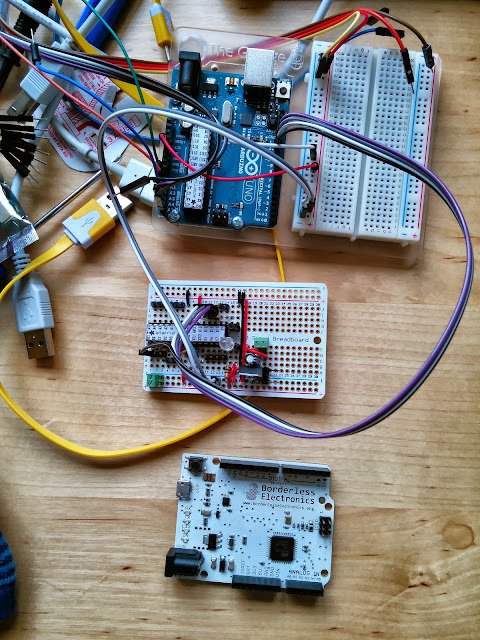 It's no secret that I'm Arduino crazy. And I've got (and need) a few. One I bought from Farnell for about £17. Then I learnt how I could build my own on a bread board, and then I just finished a soldered version on protoboard yesterday. On 26 July, I paid $22 for two Arduinos, and the promised delivery date was 20 September. The campaigned got 14x the backing planned (target $12k, actual $164 401), yes delivered on time, and increased the value to me (because of the greater backing received) by adding more goodies for free. And the kit works as expected, so I'm super impressed. This certainly would not have happened without a really dedicated project manager Harold Timmis, and crowd funding.